Is it Safe on the Outside? There are over 50,000 items for sale in a typical grocery store. The sad truth is that most of them are not food. They are processed conglomerations of ingredients. Because of this, there’s a common myth that if you shop the perimeter of the grocery store you’ll be “safe” from food challenges. More and more people are shopping just the “outside” of the grocery store, convinced that if they avoid what’s in the middle they’re only getting healthy food. Unfortunately, this is not true. Most grocery stores are set up in a similar pattern. Walk into the produce section which is usually near the bakery or the deli. Moving around the outside edges, the perimeter, of the grocery store you’ll find the fish counter, meat, poultry. The dairy section is at the back of the store. This is because the further into the store you have to walk to buy staple ingredients, such as milk, eggs, and butter, the more time you spend in the store. The longer you are there the more money you are likely to spend. On the inside aisles is where you’ll find all of the packaged, canned, and frozen foods. You often have to walk through them to get from one section to the next, increasing the possibility that you will be tempted by what is in the aisles. While the fresh food is usually found on the perimeter of the grocery store it’s important to be aware of two big issues that impact that section of the grocery store. The first is something called product placement or product creep. Grocery stores and food producers are well aware that consumers are purchasing more heavily from the outer edges of the store. Their job, however, is to sell as much as they can. One way they try to influence consumers is by moving in items that would not normally be in a particular section (but that go with those foods). One example of this would be finding packaged shortcake, glaze for strawberries, and cool whip or some form of canned whipped cream in the produce section at the height of strawberry season. The grocery store may attempt to promote this as being “for your convenience” but the truth is it’s there to tempt you to purchase it and to increase their sales and profits. Unfortunately, if you don’t take the time to read the labels you may get more than you bargained for. That glaze for strawberries, for example, contains genetically modified ingredients, excessive sugars, artificial colors, and possibly MSG. Rather than just getting fresh fruit, if you purchase these add-on items you’re also buying a wide range of chemicals and additives which may be harmful to your health. This happens all around the grocery store. Salad dressings by the salad, seasoning mixes and marinades by the meat, etc. Product placement is a big factor for grocery stores. As a matter of fact, food manufacturers pay something called a slotting fee to grocery stores to determine where in the store their product will appear. This idea of manipulating the perimeter is a big reason that eggs and dairy are all the way in the back of the store. The grocery chain, and by extension the food manufacturers, are looking to get you to spend as much time in the store as possible and encourage impulse buying. They know that the longer you are there the more you will spend. What’s In What You’re Eating? Another major concern with shopping the perimeter of the grocery store is not just what the food items are, but what’s in them. Unfortunately, it’s things that we can’t really see that pose an even bigger challenge to health. When shopping in the produce department the second thing you need to be aware of is the Dirty Dozen. Those twelve fruits and vegetables which are highly contaminated by pesticides. Eating them increases the toxic body burden. This list changes each year as the Environmental Working Group evaluates the current state of pesticides and toxins used to grow produce. The only way to avoid the toxic burden of the Dirty Dozen is to purchase organic for those twelve fruits and vegetables. To make it easy to remember the list (and stay on top of the changes) simply download the Environmental Working Group’s free app, EWG Healthy Living (ios and android). In the meat and poultry section buying organic is your best choice. Conventionally raised animals are given high levels of antibiotics, partially to keep them healthy in spite of the crowded conditions they are raised in. It’s also because these antibiotics act as a growth stimulator. Unfortunately, the antibiotics are passed on through the to end product when we then wind up consuming them. It’s important to note that the overuse of antibiotics in farming has led to an increase in antibiotic-resistant bugs. Conventionally raised animals are also allowed to be raised on genetically modified (GM) feed which is often heavily laden with pesticides. These items can have an impact on your body as well as affecting the environment. Note that the term “natural” is not the same as organic. Although there are some rules around the natural label when it comes to meat products, this label still allows for the use of GM/pesticide-laden feed. The only way to avoid added hormones, pesticides, and genetic modification is to choose organic. The dairy section is another area of concern. Not only because of the antibiotics, GM feed, and high levels of pesticides found in conventionally sourced dairy products, but also because of added hormones. rBST sometimes referred to as rBGH, is a growth hormone which causes cows to produce more milk. Studies have shown that dairy with rBGH tends to have more Insulin-Like Growth Factor 1 (IGF-1). This, in turn, has been linked to cancer, specifically of the breast, prostate and gastrointestinal tract. Although it is possible to do the research and avoid dairy with added hormones if it is conventionally raised all of the other issues still remain. Once again, choosing organic is the best, healthiest option. I was a little late jumping onto the Instant Pot train, but now I really can’t remember what I did without it! It is my absolute favorite tool in the kitchen. Pressure cooking made easy-as-pie (hmmm… I haven’t tried making a pie in my pot yet…) The ease alone would be enough but Instant Pot takes it even further – a slow cooker, rice cooker, steamer, warmer and sauté pot, and that’s just the 6-in-1 model. The 9-in-1 model also makes yogurt, cooks eggs, sterilizes AND makes cake. All this multi-tasking, no hogging my kitchen counter space – it’s a keeper. So I’ve given my Instant Pot it’s very own drawer, to store all its handy accessories. Here are my favorites. A clear glass lid is perfect for when slow cooking, sautéing, keeping food warm, or even serving direct from the pot. Having a second inner pot makes it really easy to prepare multiple dishes. I find it especially handy when I’m meal-prepping. I can make a main dish, and then quickly pop in a new inner and make quinoa, rice a veggie and such. It’s almost as handy as having two Instant Pots. The Instant Pot lid sealing ring is made of silicone. It’s really durable and will last you a long time. It can, however, hold onto food odor. I wash mine in my dishwasher after each use. I also periodically “steam-clean” it in the pot – toss a couple cut up lemons and a cup of water into the pot and cook on manual high pressure for fifteen minutes. I do have a second ring to use when I make a neutral or sweet dish and I really want to ensure no savory aromas are transferred. Stackable insert pans are great when you have more than one dish you can cook at once – steaming, cooking veggies and rice. Or cooking two dozen hard-boiled eggs at a time. These make reheat leftovers in the Instant Pot so easy and fast, a much better choice than using a microwave. A steam basket or rack is essential for Instant Pot cooking. I especially like one with moveable sides so it can adjust and accommodate food of all shapes and sizes. I like the extendable removable handle on this XOX model, it’s handy when lifting hot food from the pot. I use a taller trivet in addition to the trivet that comes with the Instant Pot, so I can cook in several layers. I’ll often cook things like sweet potatoes on the lower level and place an entrée in a pan above on the higher level. If you do this, take care that the height of the tallest item is not higher than the pot’s maximum fill line. I love my porcelain ramekins and love that they work so well in my Instant Pot. The perfect size for single serving dishes and porcelain doesn’t absorb odors or flavors. Sort of like a hot pad’s much stronger studier weight-lifter cousin. Just clip the grip end onto the hot pot, or pan or basket and lift it from the Instant Pot. My friend Coleen, an Instant Pot veteran, gave me these when I first got my pot. She was absolutely right about how much I’d love them! My Instant Pot doesn’t have the Yogurt function (sad face) so this yogurt maker cup set is on my wishlist for now. When it’s time to give my pot an Instant Pot sister, it will be the yogurt-making 10-in-1 model. If you loved this list, be sure to check out my Favorite Kitchen Tools list. I’ve done the research so you don’t have to! Affiliate Disclosure: Recommendations I share on my website may contain affiliate links. If you click through my referral link, at no additional cost to you, I may earn a small commission if you make a purchase. I only recommend products and services I use myself and would share with friends and family. Your purchases from these companies through my links helps me continue to bring you free information on my site. Fathers deserve to be showered with love every bit as much as we shower our Moms. Sadly, when it comes to the official day for Dad celebrating, Father’s Day, most of the time we’re low on ideas, having used all our creativity for Moms on their official day the month before. So, Dad usually gets a funny card and maybe a new tie. Dads are troopers. I’m here to support you and Dads everywhere. I’ve compiled a list of my favorite gifts for Dads (and any and all of the unofficially titled dad-like people in our lives). These products all meet The Ingredient Guru guidelines and are products I either own, use regularly, and/or gift on a regular basis to others. Give him a gift that he’ll really love and shower him with the hugs and appreciation that all Dads deserve. If Dad is the master of the grill, he should have a top-notch set of grilling tools. This is the ultimate of grillmaster tool sets, made from heavy-duty food-grade stainless steel, strong, sturdy and dishwasher-safe – just what Dad needs to up his barbecue game this summer. Every Dad who knows his way around a kitchen deserves a really good chef’s knife. I love my Wüsthof. With an 8” blade and perfectly balanced, this is my absolute favorite and I use it all the time. Is Dad an outdoor enthusiast? I love that. Everyone needs sunshine, but sunburn and overexposure to those UV-A and UV-B rays? Not so much. Get Dad the BEST sunscreen (imho) 3rd Rock Essentials Sunblock. Invented by my good friend, Dr. Guerry Grune, an outdoor enthusiast and research chemist, who wanted something better than the garbage ingredients found in the conventional sunscreens he used to have to put on his skin. Made from 100% food grade edible ingredients, no GMO’s, no parabens, no hormone disruptors, this is the best stuff ever. Who doesn’t love seafood? Vital Choice Wild Seafood & Organics is a wonderful, nourishing gift for Dad. When giving seafood it’s important to get sustainably fished, wild caught for the best quality. My friend Randy Hartnell knows fish. Before he started Vital Choice, he spent more than 20 years fishing wild, pristine Alaskan waters for salmon, herring, and other regional species. He’s an expert, AND he’s generous – he is offering a free gift just for Father’s Day! Use the code DADGRD18 with your order and Vital Choice will tuck in their popular Organic Salmon Marinade. That’s an added $10 bonus for Dad, and you, to enjoy. Did you know that bacon is the healthiest food.? Because it’s been cured. Socks. A regular pair of socks might fall into that ho-hum category of Dad gifting, like a tie. Luckily, these are no ordinary socks, these are bacon socks. Bacon makes anything cool, even socks. Imagine if they also smelled like bacon… that would revolutionize the sock world! For a Dad who does everything why not get him the tool that does darn near everything? Collapsible, portable, extremely useful. It’s named The Wingman for good reason. Because every Dad needs a knife, pliers, screwdrivers, wire cutters, wire stripper, scissors, package opener, bottle and can opener, file, ruler, ready for anything and more tool. If you’re going to gift Dad an olive oil jar, he’ll appreciate it even more if he has delicious olive oil to fill it with. Sandy Oaks Olive Oil Orchard, 50 acres of olive trees nestled in on a 200-acre homestead south of San Antonio, makes olive oil with love and a Texas accent. Sandy’s Olive Oil is made from Arbequina olives, soft, meadowy and sweet, and Picual olives, brisk and robust, producing a blend with complex buttery flavor. The Orchard also sells olive trees if you really want to help keep Dad’s bottle full. Is Dad always on the go? If so, he needs the right equipment for eating on the go. Eco-friendly To-Go Ware is made from lightweight, strong bamboo, so perfect for toting around. The carrying case is made from recycled plastic (to help keep plastic bottles out of landfills) and has a handy carabiner on the back so Dad can just clip and carry a fork, knife, spoon and chopsticks wherever he may roam. Perfect for Dad’s busy lifestyle and our precious planet. It’s unique combination of ecology, innovation & compassion. Dad’s need mindfulness too. Life is busy. Meditation can restore balance to the mind, to relationships, to the workplace, and to health. In just minutes a day. Packed with dozens of ways to incorporate mindfulness, great essays, inspiration pages, and worksheets, Beyond Meditation: Making Mindfulness Accessible for Everyone is an easy-to-read, easy-to-implement resource for all, even Dads. Although we officially recognize the greatness of Dads on Father’s Day, remember that dad’s day is really every day. Show your appreciation, tell your dads you love them, and celebrate Father’s Day all the days of the year. Affiliate Disclosure: This post may contain affiliate links. If you click through my referral link, at no additional cost to you, I may earn a small commission if you make a purchase. I only recommend products and services I use myself and would share with friends and family. Your support of these companies through my links helps me bring you free information on this site. Mother’s Day is always special. Of course, I believe that’s because moms are special. They nurture us, feed us, and encourage us to grow into better people. They kiss boo-boos, drive away under-the-bed monsters, and generally help to make everything alright with the world. It’s always been strange to me that we choose only one day to celebrate. That’s mostly because I think moms, well parents actually, should be celebrated every day. But we have this habit of celebrating all the moms, aunts, grandmas, heart-moms, and mom-like people in our lives in May. And they definitely deserve a little pampering. I love making my own tea blends. For delicious high-quality herbs, Mountain Rose Herbs is my number one go-to. If mom prefers a pre-blended option, they have a tasty selection of those to choose from also. And if you’re going to give mom some tea why not a beautiful teapot to go along with it? Hayneedle has a truly lovely and eclectic assortment of teapots. Plastic is so passé. It’s chock-full of unhealthy ingredients, like BPA, and it’s really environmentally unfriendly. Re-usable glass straws are here to save the day! Glass straws made of borosilicate are non-porous, hypoallergenic, shatter-resistant, break-resistant, and usable in cold and hot temperatures. Borosilicate? That’s Pyrex to you, me, and your grandmother’s casserole bowl. I have a set of four straws, which came with a teeny brush to keep them nice and clean. I also keep one straw with me in a travel pouch, so I have it with me when I visit my favorite green juice bar. I am so in love with this stuff. It’s a really delicious and convenient way to get coconut oil, along with anti-inflammatory, immune boosting spices into your daily diet. I spoon it into tea, herbal beverages, and oatmeal. I have to keep fighting off my husband who puts it in his coffee. The flavors are deep and scrumptious, created with loads of organic spices. My current favorite flavor? Chai. Next week it may be Mocha. Really, all the flavors are so good. Mom probably needs one of each, so she can taste-test her way to finding her favorite. Glasstic bottles are my favorite way to take my water along with me, everywhere. It’s a glass bottle surrounded by a tough BPA-free plastic shell. My water stays delicious, I don’t have to worry about breaking the bottle AND I help keep the earth free of throw-away plastic bottles! Great for hot or cold beverages, and there are a seemingly endless number of designs to choose from. Let’s face it when you’re a mom laundry is a way of life. You can make things easier for mom by gifting her with the last laundry bottle she will ever use. MyGreenFills’ refill program delivers eco-friendly, toxic-ingredient-free laundry wash right to mom’s front door. The refills are in powder form, so you don’t pay extra shipping for the weight of a liquid filled bottle. How smart is that? Plus, this company has an amazing mission statement and social cause. Absolutely worth standing on a soapbox and supporting. I really appreciate Gaiam’s (pronounced “GUY-um”) company message. They believe in nurturing, protecting and respecting the Earth and everyone and everything that exists on the planet. For now and for our future generations. They also make some of my yoga and fitness products. They have such a broad range of products good for gifts – comfy clothing, balance balls, colorful yoga mats, foam rollers, videos, even pet massagers – there’s definitely something here for every mom. Chocolate is a delicacy. The Mayans believed chocolate possessed healing abilities. In 1753, Swedish naturalist Carolus Linnaeus named the cacao tree: Theobroma cacao (food of the gods). Today, dark chocolate is considered a Super Food. Loaded with nutrients and high in antioxidants, dark chocolate is good for your heart and your brain, just for starters. Also, it’s delicious. Choose minimally-processed, dark chocolate with at least 70% pure cacao, free of emulsifying agents. Thrive Market has an incredible selection of delicious, clean, healthful dark chocolate for every palate – from fun and flavorful to dark and dreamy. Delicious. Because I absolutely LOVE mine. I received my Instant Pot as a gift last year. As soon as I tried it I immediately added it to my Favorite Kitchen Tools List and added Instant Pot variations to my Fast, Fun Freezer Meals recipe collection. Every kitchen should have one. Every mom should have one. Check out my Pinterest Board’s ever-growing collection of Instant Pot recipes. You can practically taste the deliciousness. Looking to give mom a calm refuge in the hurry and stress of everyday life? Consider a salt lamp. Not only pretty to look at, the soft, gentle glow of a salt lamp adds negative ions to the air and lends a peaceful tranquility to the room. I have several and love their welcoming glow when I return home after a long day. A salt lamp is perfect for every room of the house. Mom’s probably going to want more than one. This online meal planner is a plan with superpowers. If mom loves to cook but struggles with menu planning (and really, who doesn’t?) this is the gift that keeps on giving. It makes menu planning a snap no matter what your dietary plan. Just remember to take her out once in a while too. Oh my gosh this is the Best. Stuff. Ever. I met Skin Foodie’s creator, Amy, at a conference and have been a huge raving fan of her healthy skin products ever since. Everything is food for your skin – made with ingredients from nature, and love. Ditch those over-the-counter products full of toxins! And Skin Foodie knows moms – they even have a Mom Fixes Everything Balm! TOTEM has fabulous gemstone jewelry – the prettiest mala necklaces, chakra bracelets, and so much more. TOTEM Sacred Jewelry and Smudge Bar designs pieces with good vibes and lots of love. It’s the place to get mom something really special. I couldn’t resist making this list a baker’s dozen, so here’s one final gift idea: a copy of Gratitude: A Mindful Pause. This journal is the perfect little gift for mom to write down her everyday experiences and the many things she’s grateful for (including you!) Paired with some beautiful pens or pencils and it’s a gift that will keep on giving. Although we’re officially celebrating now, remember that mom’s day is really every day. Show your appreciation, tell your moms you love them, and celebrate Mother’s Day every day. Good kitchen tools can help make cooking easy, delicious and fun. I’ve put together a list of a few of my favorites, the ones I find myself reaching for over and over again. Some are new discoveries and some are my dependable old friends. Everyone needs a good chef’s knife. With an 8” blade and perfectly balanced, this is my favorite and I use it all the time. When I was displaced by Hurricane Harvey for a few months the one thing I missed the most was my knife. I love my mixer and all of the attachments that come with it. Especially this scraper mixer blade This is an amazing mixer because it makes short work of beating, mixing, and blending. I even use it to mix my meatloaf. This is the handiest dandiest tool in my kitchen. Perfect for making mayonnaise, blending soups and sauces, making applesauce, I also use it for making a bulletproof style boosted tea. My mother bought me one years ago and I remember thinking “What the heck am I going to do with it?” Now I don’t know how I’d live without it. I use it to chop everything, including making chopped salads in the summer. Perfect for making julienned vegetables and especially for ‘zoodling’ zucchini, butternut squash. I’ve even used it to julienne apples for a shredded apple dessert. I’m a big supporter of the movement to reduce plastic, especially one-time use plastic. I do my best to use eco-friendly products. In my kitchen, I’ve moved away from plastic wrap to Bee’s Wrap for food storage. Made of organic cotton, naturally antibacterial sustainably harvested beeswax, and organic jojoba oil that help keep food fresh. Each cloth is washable, reusable and compostable. Even their product packaging is sustainable, made from 100% recycled paper and biodegradable cellulose. I Iove my Vitamix. It was an investment for sure, but there’s good reason that foodies, home chefs and restaurant kitchens around the world are loyal to Vitamix. Mine gets used almost every day. Sure, it’s perfect for making smoothies, but it’s also great for blending NiceCream (“ice cream” made from frozen banana), homemade almond milk, coconut whipped cream, soup, and more. I’ve had my Instant Pot for less than a year now, and I really can’t remember what I did without it! It is my absolute favorite tool in the kitchen. Pressure cooking made easy-as-pie (hmmm… pie. I haven’t tried making a pie in my pot yet…) The ease alone would be enough but Instant Pot takes it even further – a slow cooker, rice cooker, steamer, warmer and sauté pot, and that’s just the 6-in-1 model. The 7-in-1 also makes yogurt, and the 9-in-1 cooks eggs, sterilizes, makes yogurt AND cake. All this multi-tasking, no hogging my kitchen counter space – it’s a keeper. So I’ve given my Instant Pot it’s very own drawer, to store all its handy accessories. I have so many favorites I’ve made a favorites list for Instant Pot Tools too. You can read that list here. I adore my Le Creuset pan. It’s cast iron and enameled. From eggs for breakfast to sautéing veggies for dinner, this pan practically lives on my stovetop because we use it so much. If you’re giving gifts for the kitchen this holiday season why not share a copy of my book The Pantry Principle: how to read the label and understand what’s really in your food? This is a fabulous resource to help you learn more about your food, so you can make healthy choices. Available in Kindle or paperback, it’s an essential guide for anyone who eats, in other words, it’s an essential guide for everyone. It’s never the same two weeks in a row. A collection of what I find interesting in the world of food, nutrition, and holistic health. Here’s what’s on my mind. My cell phone is what’s on my mind at the moment. At the end of last year I upgraded my phone and went from a simple SMS cell phone to a smart phone. It’s been a learning experience and while I like it I have often been reminded of the classic Groucho Marx comment: “This is so simple that a child of five could do it.” “Quick, someone fetch me a child of five.” However a smart phone is a useful tool and one which I’m grateful to have. One of the biggest reasons I like it is because now I can keep a number of health and food related apps at my fingertips. The USDA is predicting an increase in all foods for 2011; depending on the item it is expected to range from 2% for things like sugars and cereals to as high as 5.5% for dairy products. If you are interested you can see the chart here. Part of the increase is due to the higher costs for corn and soybeans. Remember, it’s a cycle, what we eat needs to eat. I actually anticipate that the costs for meat will be much higher than currently predicted due to more people deciding to purchase meat and dairy that is organic to avoid the GMO contamination of corn and soy. These are two of the most heavily GMO crops but our government doesn’t identify that so the only way to avoid it is to purchase organic. Plant a vegetable garden. Using your space for edible gardening can be attractive and save you food dollar costs. During both World Wars Victory Gardens were planted in every yard and public park all across the United States. It’s a concept that I think many people are rediscovering. Even if you buy a tomato plant at the garden center and plant it in a pot you will still get far more produce than if you purchase your tomatoes at the grocery store. And believe me, they’ll taste better. We’ve just re-arranged our side yard and brought in a load of organic dirt, working on creating a better vegetable garden. We’ve also put in herbs and a few fruits in the yard. Mel Bartholomew is the authority on getting the most out of the smallest space. If you have any gardening space available, even just one square foot, you’d be amazed at what you can grow. Rosalind Creasy shows you how to incorporate beauty and function in your garden by making your landscape edible. If you live in an apartment or don’t have access to a plot of ground you can consider container gardening. Even one reasonable size container can grow a lot of tomatoes and basil or peas and mint or…read the book. And there seems to be an increase in folks growing food on rooftops and terraces. If you shop at warehouse stores frequently the prices are good but the quantities are huge. Don’t buy more than you need, after all 50 pounds of potatoes is a lot, especially in a family like ours with just three people in the house. Just because the price per pound is low, if you wind up throwing out rotten potatoes (or anything else) you’ve just lost money. If you really want the item consider saving money by asking family, friends and/or neighbors if they want to share these items with you. This way you’ll both save money and there will be less waste. According to Jonathan Bloom, author of American Wasteland, Americans, on average, throw away half of their food. Half! That’s a mind-boggling concept. Knowing, really knowing exactly what is in your pantry is a great start, learning how to be mindful of it is the next step. Jonathan has a lot of great information on his blog to help you avoid food waste. Don’t want to read the book (although I highly recommend it)? There’s an app for that — yup, a company called UniByte has created an app to help you better manage your food purchases so you will waste less. If you do wind up with food waste, and some of it is inevitable such as potato peelings, egg shells, coffee grounds, and the like, consider composting. This is also environmentally friendly in that the food scraps become usable dirt instead of going to the landfill where they cannot be used to grow more food. 1. Know what you are foraging. Many edibles have an inedible counterpart that looks almost the same. He points out that these inedibles wind up in either the “kill your kid dead” or “keep you on the toilet sick” category so it’s important to be very sure of your identifications. 2. Forage responsibly using appropriate tools to cut and dig rather than ripping and shredding. This allows the plants to continue to grow and is the best way to forage. 3. Make sure you have permission. Here in Texas, and probably elsewhere, plant rustling is against the law. Getting a huge fine for public trespassing or theft is not going to help your grocery bill any. So here’s to a new year, a new grocery budget, and new possibilities for your health. Doing my grocery shopping yesterday several things occurred to me. 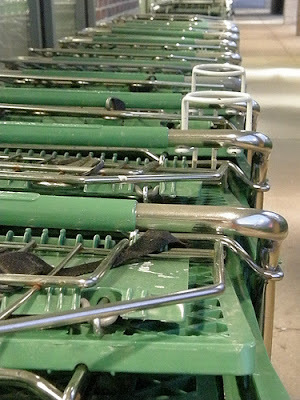 I usually try not to pay too much attention to what other folks put in their grocery carts or how they shop. Unless I’m there specifically to work with someone and help them learn how to shop healthier it’s not my place to be nosy about that. However sometimes you can’t help overhearing comments, or noticing certain things. Today was one of those days where things really stood out. If you’re willing to pay more money for organic grapes why wouldn’t you buy organic raisins? After all raisins are made from grapes. Most folks don’t know this but the reason the organic vegetables are all the way on the other side of the produce area is because there are regulations that the water from the conventional produce can’t touch the organic produce. This is to make sure that there is no cross contamination. For those people who pick up organic produce and then change their mind when they see the price of the conventional….please don’t put the organic stuff into the conventional pile. The labels on your produce tell you if it’s organic or not. Organic produce has a five digit label starting with a 9. Conventional produce has a four digit number. Coupons are created to convince you to buy products. Often they are highly processed, low nutritional value items. Not always but usually. Think about what you are buying and why. If it’s because you have a coupon and that’s the main reason, maybe you want to reconsider. If you or your children get hungry when you are at the grocery store don’t buy a box of crackers or chips to snack on; you’ll all just be cranky and your blood sugar will be going crazy by the time you get home. Buy something with protein in it, this will help balance your blood sugar. Consider string cheese, a healthy (i.e. not over-sugared) protein bar, a smoothie drink (again, choose low sugar), or some raw nuts. Better yet don’t go to the store hungry. Consider the bulk bins if your grocery store has them. As an example, at my local grocery store quinoa is cheaper in bulk than in boxes. The same is true for many other items. And a personal observation from making dinner…why does the package of brown rice wakame noodles say 4.5 servings per package and then when you open the package at home the noodles are in three bundles. How does that work? I just came across this detergent shopping guide from Organic Consumers and it’s so important that I knew I had to pass it along. It has a list of all of the soaps/detergents that use 1,4 dioxane, a known carcinogen that can cause a host of health problems. This seemed like a good opportunity to pass along a couple of other good resources that are available online.